He started by explaining acoustic levitation as a concept, and its mechanism. As an idea it’s one with a long history, he tells us that hundreds of years ago people tried mass ranks of the loudest musical instruments at their disposal to move rocks, all to no avail. The array of musicians of yore lacked the ability to control their individual phase, and of course their combined output would have balked at a pea-sized piece of gravel, let alone a boulder. Explaining the standing wave produced by an ultrasonic array. 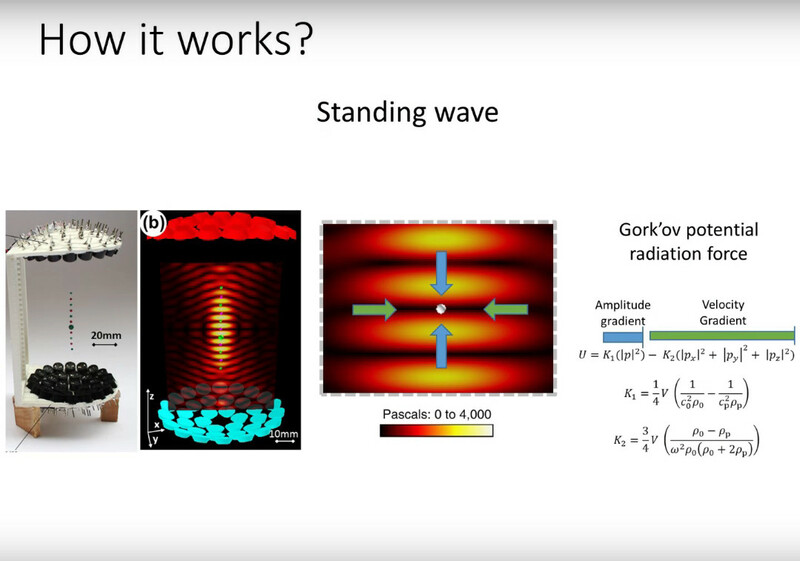 Given that we can now create standing waves between phased arrays of ultrasonic speakers, he explained the mechanism that allows the levitation. The standing wave creates patterns of high intensity and “quiet” low intensity sound, and the object nestles in one of these quiet areas. There is thus a size limit dictated by the wavelength of the sound in question, which for the ultrasound he’s using is in the order of a few millimetres. Having explained how it all works, we were then taken into the fields in which it finds an application. This was particularly interesting, because it’s the side we never see in the for-the-kids demos where it’s all about “Look, we can make the water droplet float!”. The number of fields that can find a use for it was a surprise, and formed the next phase of the talk. The first example given was in the field of spectroscopy, when reflecting light from a droplet of liquid on a substrate a certain amount of the reflected light comes from the substrate. If the sample is levitated, all the reflection comes from it and nothing else. Microgravity experiments are another interesting application, where it is possible to replicate some of the work that has previously required the environment of a space craft such as the International Space Station. This was a particularly unexpected twist. Manipulating a solid particle with a wearable array. The technique can be used for tiny particles in a liquid medium with a much higher frequency — a demonstration involves moving a single blood cell in a pattern. But Asier has more tricks up his sleeve. This technique can be used in human interactions with computers and with the real world. We saw a display in which the pixels were small plastic balls suspended in a grid, they could even be flipped in colour by being rotated under an electric field. A successive display used the balls not in a grid but as a point cloud in a graph, proving that rasters are not the only means of conveying information. Finally we saw the arrays applied to wearable devices, a handheld tractor beam, and a set of standing wave tweezers. He gave the example of picking up an SMD component, something that we can see would be invaluable. The good news for us is that this is a piece of cutting-edge science that is accessible to us at our level too. He’s made a selection of designs available online through the Acoustic Levitator site. There is an ultrasonic array, an acoustic levitator, and an acoustic tractor beam, and the components are such run-of-the-mill parts as Arduinos and motor driver boards. 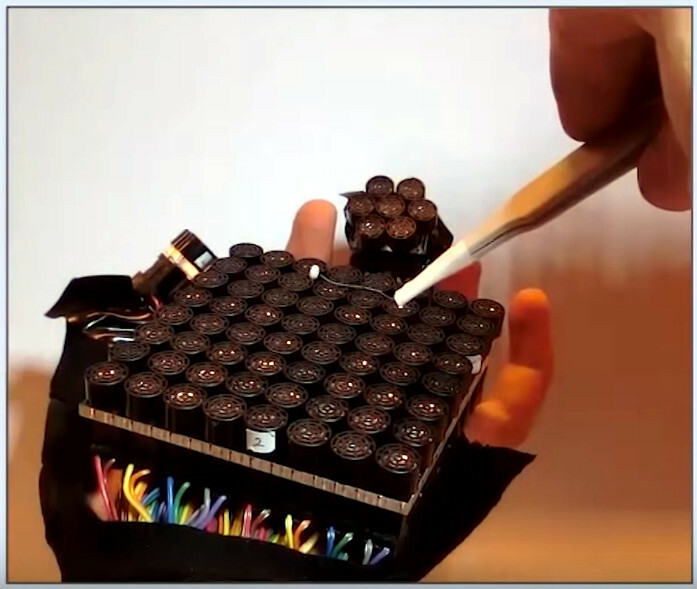 Even schoolchildren building them from kits, with an experimenter using one for Schlieren photography of the acoustic field. Finally we’re shown Ultraino, an ambitious project providing software and driver hardware for large arrays in which every transducer is individually driven, before a tantalising look at future work in fluid ultrasonics and the promise of an ultrasonic audio speaker project. Hackaday covers a huge array of projects and topics from all corners of our community. Each one is exciting in its own way, from a simple-looking Arduino project that encapsulates a cool hack to a multi-year labour of love. It’s not often though that we can say we’ve seen a genuinely cutting-edge piece of science, while simultaneously having it explained in terms we understand and being given an accessible version that we can experiment with ourselves. We are really looking forward to the projects that will come from this direction, as acoustic levitation becomes yet another known quantity in the hardware hacker’s armoury. My understanding was that a lot of the effect was due to the non-linearity of air itself as a sound transmission medium. Basically, while you could have unlimited pressure on that part of the wave, you can’t go below a vacuum, and in fact, there is nonlinearity long before that at high sound pressure levels, as are experienced for example in the throat of an acoustic horn (creating even order harmonic distortion). While not in conflict with his explanation, consider this – effectively clipping the low pressure side of a sound wave means that where the amplitude is highest, so is the average pressure…so there is actually what amounts to a net “DC” force here – lower pressure at the nodes than the poles. Yes, it “leaks around” just like a fan in free space – but right next to the suction side of a fan the pressure is lower, and conversely on the output side, a little higher than ambient. My understanding of the phenomenon is that it is caused by the object being smaller than the wavelength of the standing wave. This causes an uneven pressure profile cross the object which creates a net force. If the object is centered at the node of the standing wave, it’ll have a symateric pressure profile, so it’ll start to fall with gravity, but as it falls and goes off center, it no longer has a symmetric pressure profile. So it experiences a positive net force upwards. The net force increases in magnitude as it goes more off center from the node. In this way, it’ll always end up at some stable position where the net upward force perfectly equals the object’s weight. If it is bumped further down, the net force because larger than its weight and will move it back up. If it is bumped up, the force decreases and the object moves down. That is what makes its rest position stable. Shifting the phase of the wave slowly will move the stable position and therefore the object up and down. Isn’t that what we saw in the Black Panther movie? This is not “microgravity”. The bit of matter being suspended is still under acceleration. It isn’t like gravity was given a day off in this small area. The gravitational effect on the sample is exactly the same as if were at rest upon the surface of the planet. Gravitational (acceleration) based separation of different mass quantity components is still occurring. Microgravity is a whole nother box o rocks.